One of our most popular feature is Add to Cart Popup. Store owners know it as the most valuable email capture tool that does not even annoy customers! The idea is simple: When a user clicks on any of the Add to Cart buttons on your site, our Add to Cart Popup is displayed and users are asked to enter their email. 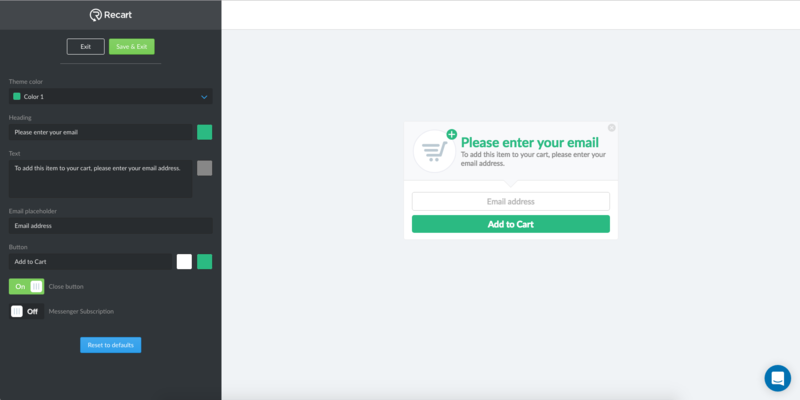 Now Recart can save that email with the abandoned cart, so you can easily reach visitors after they abandoned their cart. 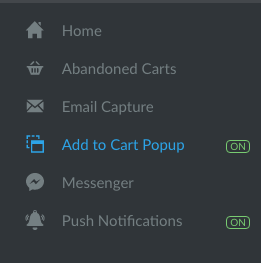 In addition to collecting emails, Add to Cart Popup also allows you to subscribe your visitors to Facebook Messenger Campaigns. It is really easy to turn on Add to Cart Popup, all you have to do is enable it on your Recart Dashboard. 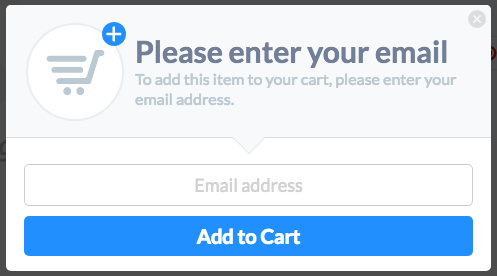 However, if you want more options, you can use our editor to get the most out of Add to Cart Popup. Here, you can edit the heading, the body, the placeholder and the button text. You can also select a color theme, or select any color your like to perfectly match your store brand. You can also enable or disable the close button displayed in the top-right corner of the popup. If you enable the close button, visitors will be able to close the popup without entering their email, and continue shopping. This might lead to abandoned carts without an email address, but some consider it more user friendly. You should check and see if Add to Cart Popup gives better results when the close button is enabled or disabled, as it can be different for every online store. If you would like to use the Add to Cart Popup to subscribe visitors to your Messenger Campaigns, you need to connect your Facebook page to Recart and enable the Messenger Subscription switch in the Add to Cart Popup Editor.